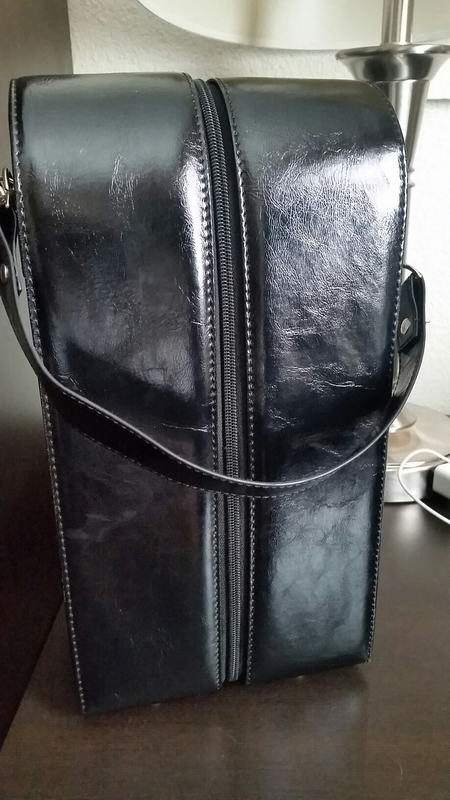 Blessing #1: My Ningxia Red travel case. This puppy keeps my Ningxia Red cold. With a little manipulation (ripping out inner walls) we were able to get Jeff’s cherry juice concentrate bottle in there to stay cool too. Double blessing! What the heck is Ningxia you may ask. Ningxia is an amazing vitamin, mineral, essential oil drink that helps a lot with mental focus and alertness. It is sometimes called gypsy juice at my house. It has put the cabash on issues I was having with aphasia. The cherry juice is for Jeff’s arthritic knees. Blessing #2: Laughter. Jeff calls it the Ninja case (not on purpose). We use the case to carry around the juice that fuels our wicked ninja skills. We laugh and invent bigger and better stories on how we use those secret skills on unsuspecting villains or kids. Adventure #1: At 11:30 pm we took a chance on a hotel in Mt. 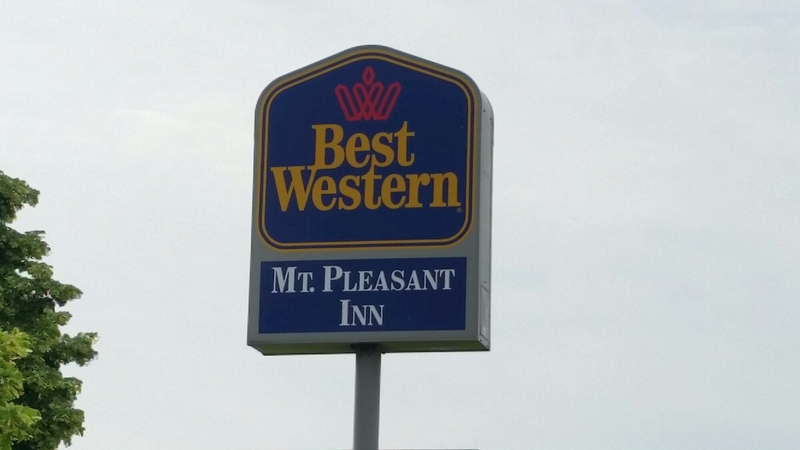 Pleasant, Iowa. Never heard of this town before, but even ninjas need to sleep. It turned out to be an okay place with nice beds but sketchy lighting. Good peanut butter. Bad coffee. 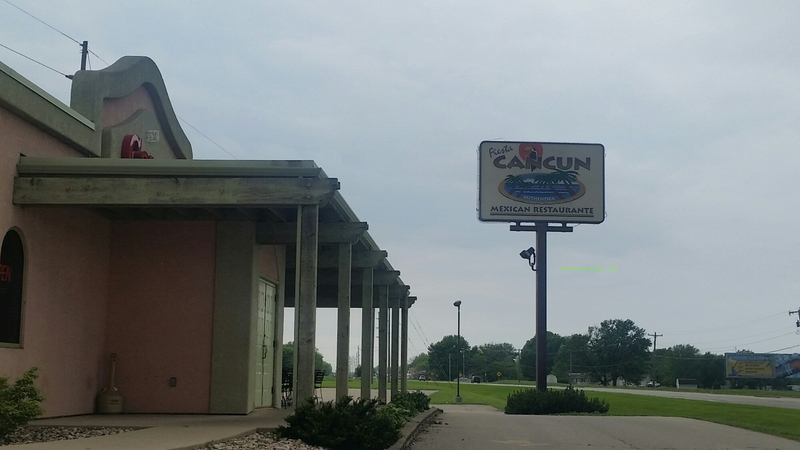 Adventure #2: Since we were making good time, we decided to find a place we have never tried for lunch in Clear Lake. Cancun fit the bill. Chips and salsa were good. Chairs had dried-on cheese and wobbled. Guac was decent. Prices great. Chicken was unseasoned and boiled. But no revenge of Montezuma or anything of that nature. So…score another point for adventure. Now it is off to a friend’s high school graduation where more blessings will be counted. She is such a sweet and sincere girl. We are honored to have a tiny part in her life story. Life is grand. And the adventure has just started. More to come…but you may miss it. We are tricksy ninjas after all. Stainless steel is painted white and then illuminated within to shine brightly in the dark. Near the sphere sculpture two guitarists serenaded visitors as they strolled through the gardens. Jeff and I have discovered a small, beautiful gem in Nashville that we’ve embraced with our whole hearts. Cheekwood Art & Garden. Small. Lovely. Artful. Natural. Peaceful. It has a golf course on one side with Tennessee mountains hugging the other three. We’ve seen it dressed in Fall leaves, trimmed with trees at Christmas, blanketed with tulips in Spring, and now aglow with lighted sculptures for Summer. The sculptures are made of letters from several different alphabets. Inside the sphere is the figure of a person symbolically contemplating language. This nighttime Cheekwood was different. Soft Spanish music floated across the landscape enticing us to whisper and hold hands. Sculptures twinkled over ponds, near hedges, around trees. It was magical. We stopped by the food truck and bought a couple of hot chicken tacos to eat on a little bench by a babbling brook in front of the mansion. 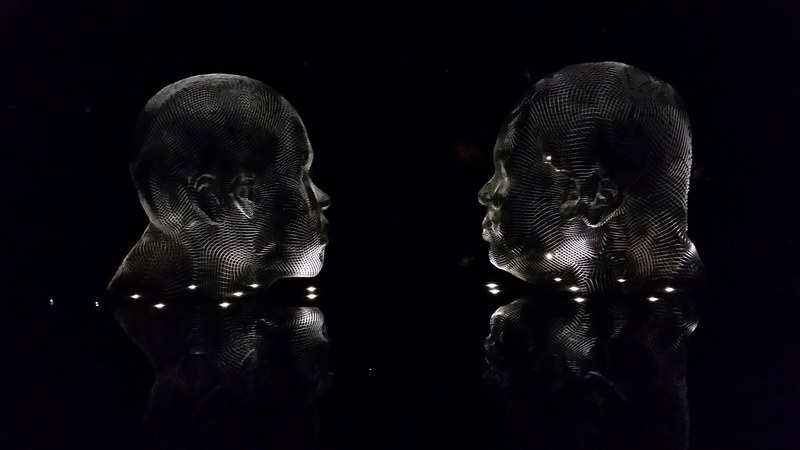 These two mesh sculptures were mounted over a pond, floating above the water with twinkling reflections. The sculptor is Jaume Plensa, a Spanish artist who certainly has a different way of looking at the world. In the mansion we watched a video exploring his art. We were surprised to find out that he is the same artist who created the Crown Fountain in Chicago’s Millennium Park (yes, the park with the big bean) that we visited a few years ago. That sculpture is an enormous wall that has an ever-changing variety of video faces spewing water unto a long wading pool. It’s a little disconcerting. And a lot cool. 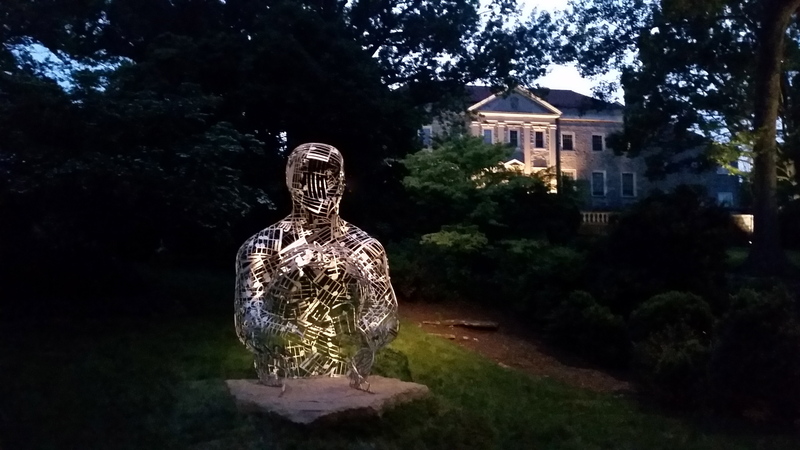 The sculptures at Cheekwood can be seen any time the Garden is open. But I highly suggest you visit on one of the Spanish Nights (July–October) to get the full effect of the sculptures. Go before twilight to enjoy the flowers, trees, and museum. Then walk the grounds as darkness settles in. It is a bit like a fairytale with twinkle lights, uneven stairs, and all. This guy can be found just down the hill from the mansion/art museum where more sculpture are displayed. Instead of letters, he is put together with musical symbols–perfect for Nashville. The first one is Switch On Your Brain by Dr. Caroline Leaf. I have been reading this with a group of friends around the country. We Skype once a week to discuss a chapter or two. Basically the book is about the science of the brain and the support for that science in Scripture. Dr. Leaf explains how we can detox our brains, leaving toxic thoughts behind by the renewing of our minds (Romans 12:2). She explains how repeated negative thoughts (stinkin’ thinkin’) can actually cause brain damage. And how neuroplasticity allows us to heal our brains by changing how we think. Mind blown. Even though there are some complex theories and medical terminology, it is surprisingly easy to follow and understand…and just flat out liberating. Reading these two books at the same time have me pondering things. One is about how negative thoughts multiply to take over our brains and cause disease and distress. The other is about cancer cells that divide more rapidly than just about any other cells on earth. Why is it that bad multiplies quickly while good steadily marches forward? What both books have in common is the concept that bad can be used for good. We can capture bad thoughts, turn them around to their positive counterparts, and use that to change how we think and rewire our brains. The cancer cells that killed Henrietta have gone on to contribute to the treatment and eradication of diseases. Without her cancer there would not have been immortal cells to use in testing. “We know that in all things God works for the good of those who love him” (Romans 8:28 NIV). We don’t understand it. It doesn’t always make sense. But he uses the bad for our good, no matter how fast the bad multiplies. I enjoy cooking and baking for people. It is my love language. But Sunday night my hubby baked for me. 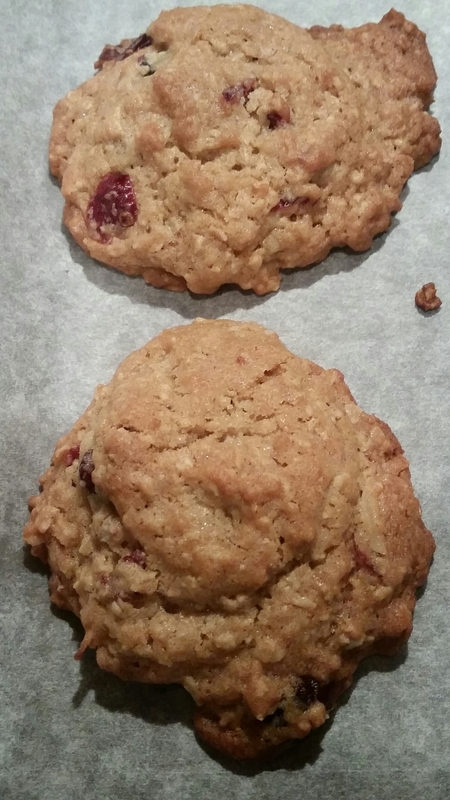 He made these amazing oatmeal cranberry cookies. OH, MY. He must love me very much (or he just really wanted cookies). They are seriously some of the best cookies I have ever tasted. Definitely in my top five. I’m calling them Love Cookies since they were made with love and I love them so much. Go make some now. In a medium bowl, sift together flour, soda, powder, cinnamon and salt. Set aside. In a large bowl, cream butter and sugar with a mixer. Mix in honey and vanilla until fluffy. Add eggs one at a time, until fully incorporated. Mix in coconut, dried cranberries, and oats. Fold dry ingredients into butter mixture. Scoop dough with one inch scoop and place 2 inches apart on parchment lined cookie sheets. Bake until cookies turn golden, 13 to 15 minutes. Remove from oven to cooling rack. Let sit 5 minutes in the pan before transferring to a rack to cool completely. Can you imagine ordering a burger and being given a bun with condiments with not even a hint of meat? That would make for some unhappy campers. Where’s the beef, indeed! Yet I wonder how many of us are missing the meat in our relationship with God in much the same way. (I know that was quite a segue, but just go with it.) We go to church, volunteer to help at the food bank, maybe even host a group at our home. Our faith looks good. But when it comes to the meat of the gospel, are we cheating ourselves? Are we missing the meat to load up on extras? Going to church is wonderful. Helping the needy? Hoorah. Volunteering? Selfless and admirable. All these things are amazing gifts that are needed and appreciated. But without a daily relationship with Jesus all that is just a bun with condiments. It is not filling. It is not satisfying. It is not soul-saving. The gospel is that Jesus was sent by God, that He was crucified for the sins of mankind, buried, and rose again. That’s the message. Everything else is a condiment. Good morning, God. When I go through a hard winter, I never wonder if spring will fail to come. I know it will come. That is the nature of seasons—spring follows winter every time. It never fails (even though some years we have our doubts). I know that Your nature is even more dependable. Your love and Your grace will always be there. Your answers always follow my prayers. I can trust You. I give my heart to You and know You will keep it safe. Your love is more constant than the seasons. You own the day, you own the night; you put stars and sun in place. You laid out the four corners of earth, shaped the seasons of summer and winter. God’s been dealing with me lately. He’s been asking me what I am doing with the talent and experience He gave me. I am not usually a person who puts things away to use once a year or to save for “good.” I’m a “use it all up and enjoy it right now” kind of gal. But for the last few years I have not been writing. What is up with that? So I signed up for a writers’ group at Patsy’s house. Last night was the first meeting. The twelve of us are varied in age, life experience, careers, and ambition. We are songwriters, letter writers, e-mail writers, book writers, poets, and backpack note writers. But we are all hoping to shake some words out of our brains and onto paper through creative exercises and story sharing. How about that? God’s voice coming from a cute Sugar Boo deck of cards. When I get to heaven I want to stand before Jesus able to say it’s all gone, I gave my all. I used my talents, turned them inside out and backwards and used them again like a pair of underwear when my luggage was lost. I want to be able to say I made dresses out of the drapes and snowshoes out of the tennis rackets of my life that weren’t being used for anything else. I want to be used up like toothpaste that has been scraped out of a cut-open tube in a prison camp. I want to write words that encourage, serve others until I’m exhausted, and love with abandon. But, most of all, I want to WANT all of this more than I want to watch the next TV show, try a new recipe, or take a soak in the tub. I do not want to keep anything back for a later time. I want to, every single day, be spent. With all this going for us, my dear, dear friends, stand your ground. And don’t hold back. Throw yourselves into the work of the Master, confident that nothing you do for him is a waste of time or effort. I loved Easter as a child. Not only because it meant egg hunts and chocolate. It was also one of the few times each year when the city cousins came to visit. That meant parties, food, and fun. The adults would laugh, drink, and play cards. The kids would laugh, play board games, and run wild. But in the middle of it all, The Ten Commandments would be aired on ABC. This was back in the early ’70s when we lived deep in rural Missouri. Our television could only receive signals from three channels (ABC, NBC, CBS), with two more (PBS, and channel 11) available if the cloud cover was good and the wind hadn’t blown the aluminum foil off of the antenna. I loved The Ten Commandments. To me it was the essence of the Easter season. So while the party was going on in the kitchen, I would shush the participants so I could hear Charlton Heston lay down God’s demands to Pharaoh on the other side of the bar in the living room. I was usually alone in my viewing bliss, the other kids having run off to play in the creek or jump out of the barn or something. For many years, everything I knew about the book of Exodus was based on that movie. From it I developed a childlike faith in miracles and a deeper belief in God’s love for His people. I learned I didn’t want to have a hard heart because God would plague me with locusts or bloody frogs. I was in awe of God’s power and Moses’s ability to display that power. 2. Even if we feel unequipped to do what God asks us to, He expects us to persevere. Moses didn’t get out of speaking just because he stumbled over words. God told him that his mouth was made by God. And when Moses argued further, God sent his brother Aaron to do the talking (that wasn’t in the movie!) But Moses was still expected to show up and give his A-game no matter what. 3. God has ultimate power, but don’t underestimate evil. When Moses and Aaron demonstrated God’s power, Pharoah’s magicians produced magical signs themselves. Satan fights tooth and nail for our time, our hearts, our minds, our souls. We must cling to the True Power and not fall for the hocus pocus. I can get sidetracked with the magic show, caught up in the smoke and mirrors and forget that a battle is raging for our souls. Hell is real. God is power. Don’t get faked out. With Easter just a few weeks away, I am excited for the return of The Ten Commandments. It will air at 6 p.m, April 5, on an ABC channel near you (or online). I know it is long and very dramatic and you may have seen it over and over. But watch it anyway. Throw a party with your city friends. Look for new insights. And enjoy the magnificence of Charlton Heston at his finest. This weekend as Jeff and I were eating lunch out, I noticed a little boy about three years old politely asking his Daddy for some of the whipped cream from his dessert. The father had laughing eyes, was gentle and kind, and put a dob of the whipped cream on the boy’s nose. Behind them sat an older woman with a cute knit hat on her bald little head. She was giggling about something her table mate said. The milieu brought to mind my friend Bethany, who recently left behind a similarly laughing-eyed husband and sweet son, and wore her share of cute knit hats as she lived life with cancer. Bethany passed away on Friday. Now I imagine all those sad little hats lying there unworn. Grief. There is that. But it is more than that. It is pure emotion. It is joy that she is with Jesus. It is relief that her suffering is over. It is anger and rebellion and disbelief that she is no longer with us. This woman was loved. Really loved. 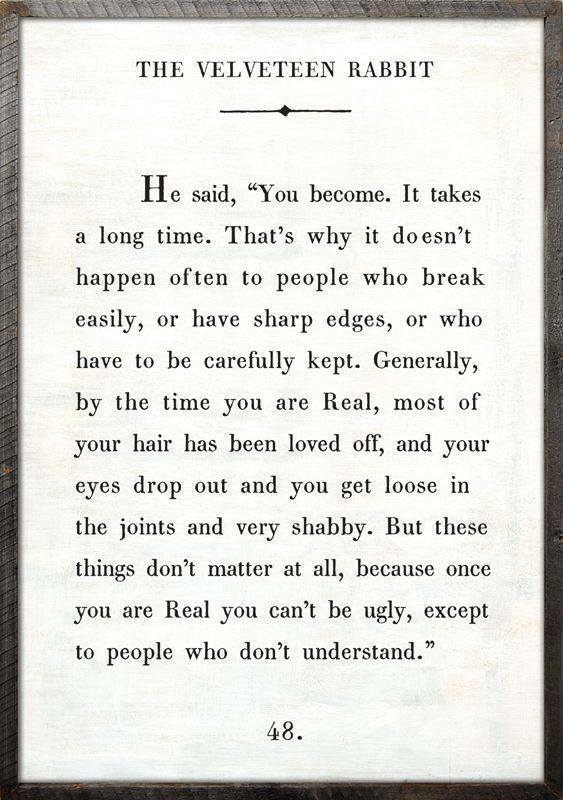 Just like the Velveteen Rabbit, she had her hair loved off. Yet she was beautiful. And we were more beautiful for knowing her—for we understand in a way that we may never have before what is important in life. And it is not hair or clothes or houses or cars. It is family and friends and moments, small and large, that make up a simple day. It is laughing and crying with people who understand you without saying a word. It is the shared joke, the thoughtful gesture, the text that says, “I’m thinking of you.” It is the rubbing along together in a world that can beat us up and wear us down, but never break us apart. It is becoming real with people who you know are praying for you and for whom you pray. It is love that is so true and pure and deep that this world cannot contain it. That is what is important. And that is who Bethany was. I am grateful to have been even a tiny part of her journey. We know what real love is because Jesus gave up his life for us.